Introducing something new to the collective. I’m Baz Stevens. I go by the name Baz King on the internet. It’s an old story, ask me about it at a Con. I’ve been roleplaying since the first big flush of D&D in the late 70s, and have been the GM pretty much since then. There aren’t many games I haven’t owned or played in that time. Who am I : Ashley Griffiths, I go by the handle NimbyDagda most places on the internet including on the UKRP forums. How I get money to pay the bills : Dev-Op (which is kind of like a computer programmer and systems administrator all smashed into one). How I lose the money again : I design and publish roleplaying games, ones that tend to be especially far towards the crazy hippie end of the market. Stuff I’ve made : My first game was published a year ago and is called What You Wish For its a structured free-form game about people taking stock of their lives and striving to make them better. I am also responsible for one of the more controversial games to come out of the UK indie scene which is my game poem about a grief support group for people how have lost young children called Though Our Arms Are Empty. Day Job: Travelling English teacher. Play Pretend Job: Pompey Crew Design is myself and my bro-in-crime Kevin Barthaud, and we made Witch: The Road to Lindisfarne, a game about burning a young woman. 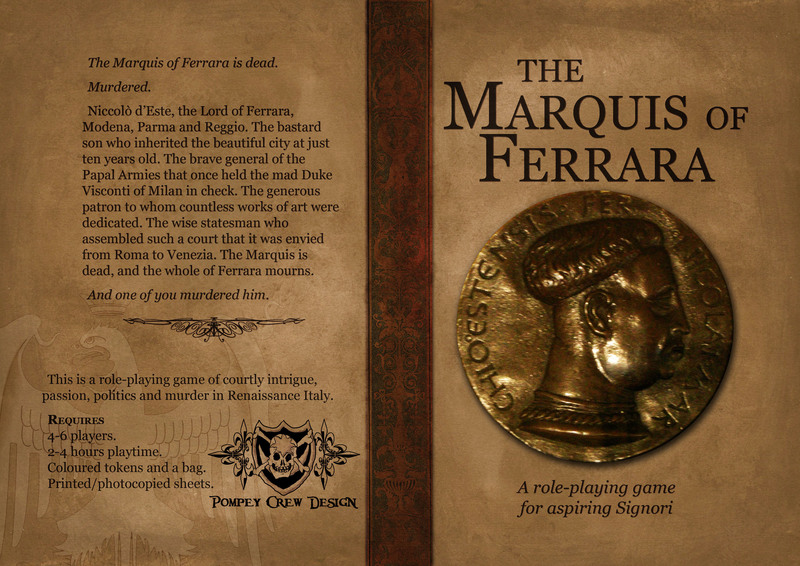 And we’re currently working on The Marquis of Ferrara, a game about murder and courtly intrigue.